The first unit of this course addresses the definition of history. Following this, students will identify the skills needed for studying history, and how those skills can be applied to various careers. Students will also compare types of sources, and they will delve into misconceptions within the discipline. This unit is designed to prepare students for studying the concepts covered in later units. 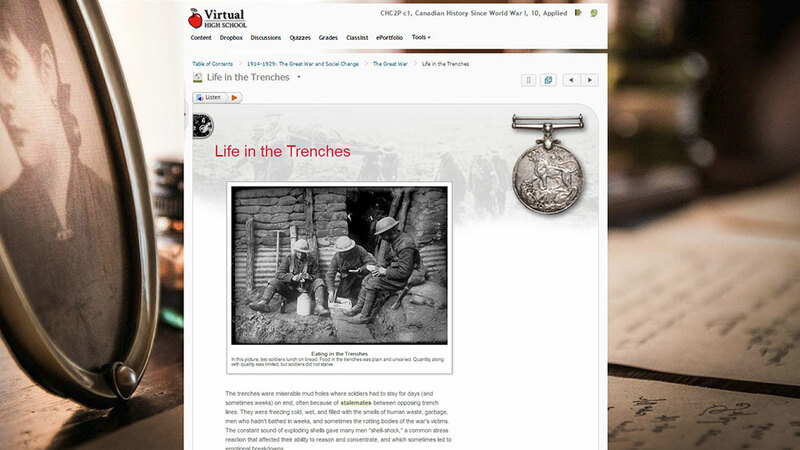 This unit focuses on a pivotal era in Canadian History; the years during and following the First World War. In this unit, students will learn about the perspectives of various regions and groups within Canada during the period. In examining the First World War, students will analyse Canada's participation, and what the country's participation meant for Canada. Students will examine the economic, political, and social impacts of Canada's involvement in World War One. This unit covers the stock market crash, which resulted in the Great Depression, and Canada's involvement in the Second World War. While studying this period, students will investigate the impact of the Great Depression in Canada, the concepts of racism and anti-Semitism, and how Canada was perceived on the International Stage following the Second World War. The fourth unit in this course covers Canadian history from the end of the Second World War until 1982. During this period, Canada made huge advances in protecting its citizens from economic hardship and human rights violations. Students will analyse changing philosophies regarding the responsibilities of government, and the development of a Canadian identity. This unit will also examine Canada's role in the Cold War and in international politics. The final unit of this course will take students through an in-depth analysis of modern Canada. Students will examine daily life at the end of the century, the changing cultural and political environment from the early 1980s to the present, and how Canada has grown to be a major power on the international stage. The final portion of this course is composed of a two-part final project. Throughout the course, students will be developing a website. Following this, students will be required to complete an oral response in which they critically assess various aspects of their website.